As the adage goes, if you work hard enough at something success will follow – even if that something is partying. In Iowa City, Iowa, happy hour is a prospect that is taken very seriously, and for that reason Princeton Review has named the University of Iowa the No. 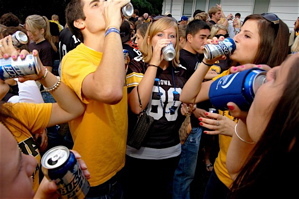 1 party school for 2014 in its annual Top 20 list. Iowa has been hovering around the No. 1 spot for several years now, securing second place in 2013, and No. 4 in 2012, but the tradition of party excellence in Iowa City dates back to the early 1960s, when the campus was a counter-culture hot spot. 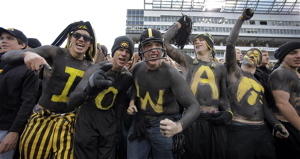 Iowa continues to have an interesting mix of crunchy hippies, Magnificent Mile fashionistas, and inked-up indie kids that coexist in the land of The Hawkeye. The bridging mechanism between all these various demographics is the party scene. Spilling out across the street from Iowa’s downtown campus are 70 bars and restaurants. Unlike most college scenes, where watering holes come and go faster than an overwhelmed freshman, Iowa City is full of “Right of Passage” establishments. Places like the Deadwood, Airliner, Joe’s Place, The Mill, The Vine, The Sanctuary, George’s, Mickey’s, Dublin Underground and the Fox Head, have all been around for generations. There also is plenty to like about the live music scene in Iowa City, as the campus is located about four hours from Chicago, Milwaukee, Minneapolis, St. Louis, and Kansas City, which attracts plenty of touring acts, in addition to the fine local talent. Still, Iowa football remains the big dog on campus. 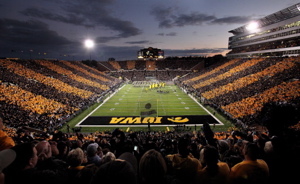 Kinnick Stadium is a mile walk from downtown, which most folks make carrying a beverage. The area around the stadium becomes a sea of Black & Gold, as young and old partake in all manner of drink and grub leading up to kickoff. This fun and frills combination serves to draw a rambunctious mix of students, from Iowa and surrounding states, particularly from the greater Chicago-land area, adding urban fuel to the party scene. University of Iowa officials continue to try and downplay the top party ranking, as they attempt to get a grip on the problem of underage and binge drinking. 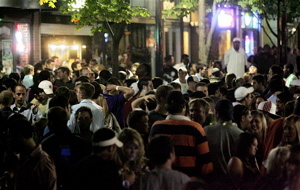 A recent ordinance raised the age from 19 to 21 for those allowed to stay in the bars after 10:00 p.m., and prohibited drink specials like “Ladies Night,” where women could drink all evening for $1. Police have also cracked down on open container laws during tailgating, which hasn’t been received well by alumni. Yet true improvement has been slow to materialize. I served as the court clerk for weekend lockups at the district court in Iowa City from 2007 to 2009, and the number of drinking-related citations and arrests surrounding home football games were routinely in the hundreds. The stench of alcohol from defendants in the satellite courtroom, located in a nondescript space on the second floor inside the jail, was overpowering some mornings. A sea of red, watery eyes stared back at me, some looking down and shaking their heads in shame. 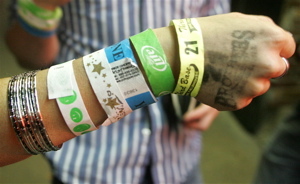 As each defendant stepped forward most shared a similar fashion accessory – multiple hand stamps and wrist bracelets from admissions to numerous bars. Binge drinking is big at Iowa. Beer bongs, beer pong, Jägerbombs – high octane alcohol is served in a pleasantly ingestible format so it may be swilled down faster, or is part of a game to ensure steady consumption and rapid intoxication. This creates a target-rich environment for police. They record high arrests by picking off the low hanging fruit – those that are so drunk they perform some epically stupid public act for all to see. After drinking themselves to the point of oblivion, the folks showing up in court have little to no idea what they did to get arrested. Their bodies had become mere vessels, marching around on autopilot, operating purely on the whims of impaired judgement. One young woman arrested on public intox charges had a breathalyzer reading of .26, over three times the legal limit. At 5’5″ and 125 pounds this was especially crippling. The police report stated she saw a car running on the street downtown by the Sports Column, a bar popular with fraternities and college athletes. In her inebriated state she felt a compulsion to reunite the vehicle with its missing owner, but needed to find out who owned the car, so she opened the passenger side door and got inside. Unfortunately the vehicle happened to be a police cruiser. As she attempted to radio the dispatcher to inquire about the vehicle’s owner, officers came running. That was the end of her evening. Another night police witnessed a student hiding behind a pillar in a parking garage, pants unzipped, boxers exposed, who then staggered into the street, clearly attempting to urinate in public, but incapable of handling such a maneuver. He blew a .30 – quite an impressive level of intoxication. Then there was the young man who was jacked on controlled substances, and thought it was a good idea to start burning plastic beads at the Kum ‘N’ Go gas station. He was charged with Reckless Use of Fire/Explosives. Once at the jail, we had to convince him he was granted an audience with the “Great One” in order to get him to put some clothes back on and behave so he would come out of his cell and appear before the magistrate. Placing his hands together in a praying motion, the kid bowed to the judge, and spent the rest of the proceeding rocking back and forth in his chair. These kinds of stories go down every night in Iowa City. Kids drink themselves into a state where they no longer have the sense God gave an acorn. Even after reading descriptions of the incidents leading to their arrests, most have no recollection of their behavior. Some audibly laugh and turn to other defendants in the courtroom to share their exploits, which does not go down well with the judge. Some of this sounds humorous on the surface, and it is, until you see the sheer volume and repetition. There also is a much darker side to the level of drinking and drug consumption that commonly occurs at Iowa. It’s not odd to see a guy running down Iowa Avenue, past the bars and into the adjacent off-campus neighborhood, with a drunken woman draped across his shoulder. They’re heading for a house party most likely, and she is laughing, but what are her chances of being able to make a coherent decision on sleeping with that guy or several more that same evening, or of even being able to say the word NO. Routinely friends come to visit students at Iowa, and they end up getting blasted out of their heads at the bars. Ultimately they get separated from their friends during the alcohol-filled festivities and come stumbling back at 2:00 a.m., to try and find their friends’ houses, but can’t quite pinpoint the exact one. Then a home invasion occurs. A wasted kid kicks the door open or throws a porch chair through a window and enters the house he believes to be his friend’s. Problem is he entered the wrong home. Confusion sets in and the perpetrator wants to fight the legal resident, who has been surprisingly awakened. In a bigger city this would get the perpetrator shot. In Iowa City it usually ends with an arrest for trespassing, assault, and public intox. Though it has resulted in at least one murder. The twisted part about all this is for decades administrators at the University of Iowa have consciously elected not to address the alcohol or controlled substances abuse by its students, which in my book makes them complicit. Colleges are big businesses, and smart business practices dictate that administrators protect their products. At Iowa part of that product is the school’s reputation. It is ranked as one of the top public universities in the county, and offers a superior education at a great value in terms of tuition costs. The University of Iowa Hospitals and Clinics, along with the law, journalism and business schools, are all cutting edge, and Iowa is home to the Iowa Writers’ Workshop – the premier graduate writing program in America. This part of the Iowa business model sells itself, but all the Big 10 schools are solid academic institutions, so much like how Iowa has to work diligently to recruit top-level athletes, it also has to be creative in how it fills its freshman classes. Each out-of-state student pays three times the tuition of any single in-state resident, and administrative bean-counters love landing them. Make no mistake, Iowa’s party reputation serves as a national advertisement for kids seeking a good education and wanting to have a fun time getting it. Earning Princeton Review’s No. 1 party ranking is priceless in terms of the free publicity it provides. The university would never publicly condone the party-culture at Iowa, but it also did little for years to decrease its escalation. It took arrest and citation numbers so obnoxious that Iowa City became a national example of underage drinking excess, along with some human casualties, before Iowa and city officials stepped in – as that highly valued academic reputation began to get tarnished. It’s also important to consider the large amount of city revenue generated by the fines and other assorted expenses associated with the drinking and drug culture at the University of Iowa. If police officers walk into a downtown bar, which they do often in Iowa City, and find an underage student drinking or in direct proximity of an alcoholic beverage, he or she will be cited for a PAULA (Possession of Alcohol under the Legal Age). A first offense is $314. That’s $200 for the fine, a 32 percent “surcharge,” and $50 court costs. A second offense is a whopping $710, plus the defendant is required to obtain a substance abuse evaluation or lose their license to drive for thirty days. Public intox and disorderly conduct are both simple misdemeanors, but you are going to jail. These are punishable by up to 30 days incarceration, and incur fines of between $65-$625 each, or a combination of both. A student hitting for The Cycle could be facing over $1,500 in fines. That’s no joke to a college student. I’m all about personal responsibility. You do the crime, deal with the consequences. I don’t want to hear crying about what mommy and daddy are going to do to you. On the other hand I want the university to step up and be a more responsible role model. Parents are sending their children to Iowa with the expectation that the university is looking out for students’ best interests. IC NITEHAWKS: I built this “extremely basic” website in 2008 for a project in my journalism Web Basics class, but it turned into a functional tool for students to find the best drink specials in Iowa City on a nightly basis. This entry was posted in Liquor, News and tagged Deadwood, George's Buffet, Hawkeyes, Iowa City, Joe's Place, Princeton Review, University of Iowa. Bookmark the permalink.